Constructed in a lighter weight Cordura material, Ortlieb Rear Roller Plus Panniers have been treated to a QL2.1 rack fitting upgrade. These are the panniers to go for if you appreciate Ortlieb's German manufactured quality but prefer a more fabric-like material over the Classic's shiny finish. Robust QL (Quick Lock) rack hooks are a stand-out Ortlieb pannier feature. They offer total security – these panniers will never jump off the rack - yet their easy-on easy-off action is so intuitive and effort free, one of our customers was moved to described it as “so simple, it’s like witchcraft”. The benefit of the QL2.1 version is that it can be set up (no tools required) to adapt to an even wider variety of rear rack configurations and dimensions than the original QL1 system. Coming with inserts, the pannier hooks can fit racks with 8, 10, 12 or 16mm top rails, as described in Ortlieb's own video. This video perfectly illustrates how Ortieb's QL hooks tenaciously secure each bag to the rear rack, yet offer instant release - simply by lifting the bag upwards by its handle. 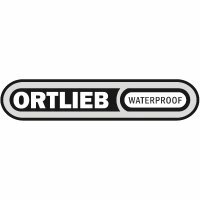 High frequency welded construction - no stitch holes further ensure Ortlieb bags are 100% waterproof. Roll-top closure (hence the name Roller Pannier) - by rolling up the top of the bag three times and securing it with a buckle, water won't get into this bag - even if you drop the pannier in a lake. Each pannier's simple one-compartment construction contributes to its waterproofness. Also, compartmentalising a bag effectively reduces its usable space: single compartment bags like these Back-Rollers can hold more. Shoulder straps make these bags more portable off the bike. Large 3M retro-reflective triangle patches on the front and rear of each pannier help ensure you are seen. Each pannier is 42cm high x 23-32cm wide x 17cm deep (16.5 x 9-12.5 x 6.7 inches) = approx 20 litre capacity. Weight: 1,680g per pair - based upon weighing Ortlieb Back-Roller Panniers at Bike Co-op HQ in May 2015. For the full Ortlieb story, visit our blog.